Gerade noch rechtzeitig möchte ich euch über das nächste Konzert informieren – der Text stammt vom befreundeten Omnidiet Newsticker, der Blog der Hotel/Event-Location und Künstleroase ‘Omnidiet Resort and Business Hotel’ oberhalb des Lago Maggiore, in der regelmäßig Live-Auftritte von Michel Montecrossa and his band The Chosen Few stattfinden. Es wird diesmal ein Gesamtevent werden, der als Vorprogramm Infos und Antworten zum nächsten Projekt des Omnidiet Hotels geben wird – die Installation eines kostensenkenden, mit alternativen Energien betriebenen Energiesystems, das dann mithelfen wird eine weitest-mögliche Umstellung des Omnidiet Hotels auf alternative Energien durchzuführen. Dieses Projekt, das auf einem direkt ans Omnidiet Hotel angrenzenden Terrain installiert werden soll, wird von der Firma MiraSolaris realisiert werden, die am 22.03.2008 von 20:00 – 22:00 Uhr darüber informieren wird. Gleichzeitig bietet MiraSolaris die Möglichkeit der Kontaktaufnahme für jeden, der angesichts der ständig steigenden Energiepreise sein Haus auf alternative Energien umstellen möchte und eine Firma/Partner sucht, die sich um alle Einzelheiten bei der Durchführung dieser Umstellung kümmert. MiraSolaris Vorprogramm von 20:00 – 22:00 Uhr. Ein echter Kenner wird diesen Event natürlich durch ein superleckeres vegetarisches oder nicht-vegetarisches Omnidiet-Menü abrunden. Man erkennt die Menschen, die zu diesen Kennern gehören oftmals an ihrem strahlend-glücklichen Gesichtsausdruck und einer ansteckenden Feierstimmung, die sie umgibt!! ‘Changing World’ – zweite CD der ‘Peace & Climate Change Concert Tour’ erschienen!! Changing World’ is Michel Montecrossa’s second great cyberrock & slam poetry concert of his ‘Peace & Climate Change Concert Tour’ released by Mira Sound Germany on double Audio-CD and double DVD presenting 35 Michel Montecrossa super songs that make everyone listen. Included are stunning topical songs like ‘It’s Still Heaven And Hell‘, ‘Ecological Music #2‘, the german ‘Gift‘, the band version of ‘Sunray Revolution‘, the power-guitar version of ‘Earthrocker Callin’ You‘, a killer version of ‘Vomit Of Your Soul‘ and masterful ‘Truth Of The Moment‘. Mirakali and Diana Antara contribute their duo ‘Green Girls‘. About ‘Changing World’ Michel Montecrossa says: “CHANGING WORLD presents songs about our times. The environment changes and we face an urgent need for change of consciousness. New thinkin’, new awareness, new attitudes are needed. We must change our habits. We must adapt to the unfolding crisis. We must confront daring questions and chilling consequences. We must be ready to live on a planet with dwindling resources. We must halt global energy wars. We must find new ways of progress. They are there in our consciousness – if it changes. 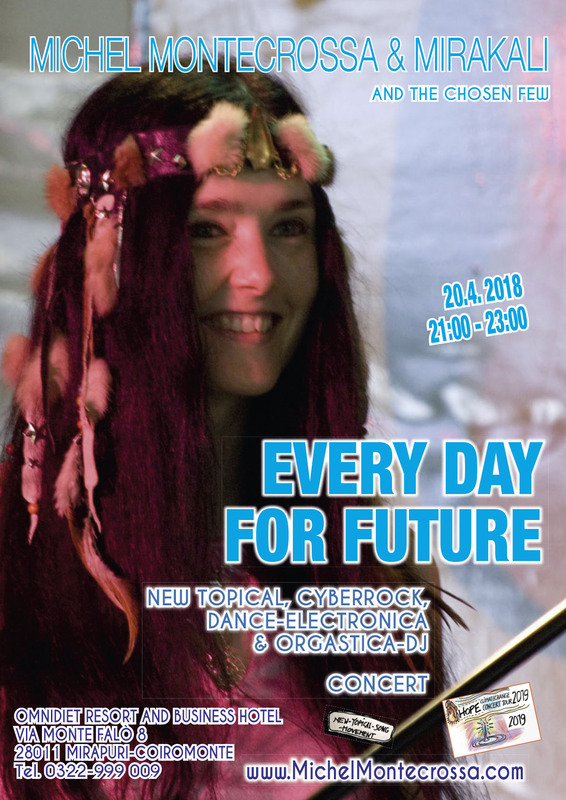 Hier geht es weiter mit ausgezeichneten Texten der Lieder von Michel Montecrossa, Mirakali und Diana Antara, die sie live auf den Konzerten der ‘Peace & Climate Change Concert Tour’ präsentieren. Ich habe diesmal das Lied ‘Changing World’ von Michel Montecrossa und ‘Earthpower’ von Mirakali ausgesucht. that belongs to the strong. alive like the heroes and their courage. Earthpower is nothing for the weak. but strength that always wants the better. deeper than all you have ever been. Earth exists since millions of years. longer than all your vain creations. The earth creates more than you ever will. and here on earth she makes them all real. wide like the sky of their inner well. with comrad stars in galactic becoming. to be open to the drive of the morn. True strength means to feel love that‘s always newborn. she is the sky of earthpower‘s bride. alive like the heroes of this beautiful star. Earthpower, glory and triumph of dawn. Hier ist sie!!!! 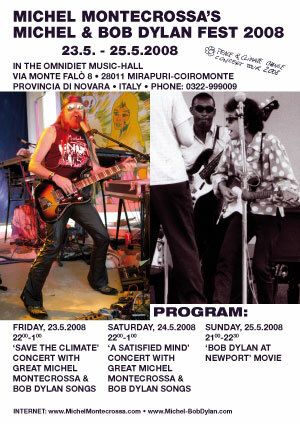 ‘Sunray Revolution‘, die erste Doppel-CD von Michel Montecrossa’s ‘Peace & Climate Change Tour’. Die CD bietet 29 Supersongs von Michel Montecrossa, Mirakali und Diana Antara – Themen Songs wie ‘Sunray Revolution’, ‘Changing World’, ‘Sun and Peace’, ‘Shall we go to war again?’ von Michel Montecrossa bieten High Drive, musikalische Stilvielfalt und die Aktualität und unkonventionelle Klarheit von einem der innovativsten Slam Poetry Songwriter/Musiker des 21. Jahrhunderts. Die Doppel-CD ‘Sunray Revolution’ ist der Live-Mitschnitt des gleichnamigen Eröffnungskonzertes der ‘Peace & Climate Change Tour’ vom 23.02.2008. Die blau unterstrichenen Songtitel in der hier weiter unten aufgeführten Original-Pressemeldung dieser CD sind Soundfiles/Hörproben verschiedener Lieder (im Real Player Format). weitere Songs u.a. : ‘Are you ready for a change’ von Mirakali und ‘World of Love’ von Diana Antara. Michel Montecrossa’s great cyberrock & slam poetry opening concert ‘Sunray Revolution’ for his ‘Peace & Climate Change Concert Tour’ released by Mira Sound Germany on double Audio-CD and double DVD presents live 29 Michel Montecrossa super songs that make you listen. Included are incredible topical songs like ‘This World Is My World‘, ‘Sunray Revolution‘, ‘Changing World‘, ‘Sun And Peace‘, ‘Voice Of Peace‘, ‘Shall We Go To War Again?‘, ‘Something’s Crushin’ In‘ and ‘Green Earth‘. Mirakali and Diana Antara contribute powerful songs like ‘Ready For A Change?‘ and ‘World Of Love‘. Eine kurze Sache mal vorab – ich habe mich entschieden, diesen Blog zu internationalisieren, d.h. ich werde die Posts hier zweisprachig schreiben. Hallo, ich werde in nächster Zeit immer mal wieder Songtexte von Michel Montecrossa’s ‘Peace & Climate Change Tour’; (Songlyrics von Michel Montecrossa, Mirakali und Diana Anatara) hier veröffentlichen: Beginnen möchte ich mit den Songlyrics von ‘Sunray Revolution’ von Michel Montecrossa und ‘Blue Star’ von Mirakali. Hi to everybody, – yeah, I decided to write here from now on in 2 languages: In the coming time I will regularly publish on this blog songlyrics of songs presented during Michel Montecrossa’s ‘Peace & Climate Change Tour’; (Songlyrics by Michel Montecrossa, Mirakali and Diana Antara). I will start with the songlyrics for ‘Sunray Revolution’ by Michel Montecrossa and ‘Blue Star’ by Mirakali. Come gather ‘round people, I sing you a song. ‘Bout the past and the present and the things to come. Bout the sun and the earth and we who are one. ‘Bout the past and the present and the things to come. The jungle was born when time was young. Slaves of greed, heartless rules they impose. My child, are you wonderin’, are you cryin’ for love? The climate is changin’, is smashin’ your door. and find out the ways to save our life. the science of finding what we need most. that weakens our life, takes away the glow. She is a beautiful planet. Full of wonders is her life. Like a young maiden she is bright. Dancing with millions of lives through a galaxy of light. What she needs is love, what she gives is all. with your greed for her treasures. Don‘t take away what belongs to all who live on her. This blue star is our home. Don‘t be so ugly, try to understand. Don‘t be so heartless, better show mercy. The life of our planet has changed. Tears in her face, wounded by your hunger for more. Can‘t you feel her pain, don‘t you feel ashamed? What have you done? Will you change your mind? Of climate change you speak, of war and crime. But what we need is love. Find back to your heart and what‘s there inside. conscious of love, the helpful force. Then all your dreams are strong of friendship and hope. If you can‘t love, nothing will change to the better. If you can‘t love, the abyss will be the goal. Don‘t take away what belongs to all.